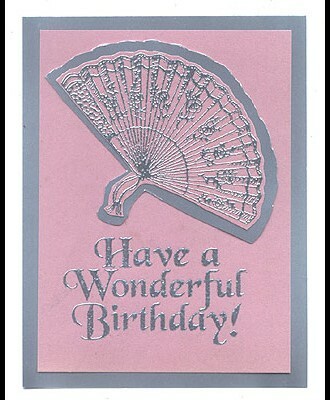 “Have a Wonderful Birthday!” is embossed in silver on mauve card stock which is layered on silver card stock. “Rose Fan, Sm.” is embossed on mauve card stock, cut out and layered over a cut out of silver card stock and adhered to the Mauve card stock. Card by Margaret Wiggin. Tags: Embossed, Have a Wonderful Birthday!, Margaret Wiggin, Rose Fan Sm.